The gigantic and pungent Titan Arum or Corpse Flower (Amorphophallus titanum), which can reach up to 10 feet in height, is slowly disappearing from its native Sumatra rainforests. The conversion of Sumatra’s rainforests, the plant’s natural habitat, by timber concessions and oil palm plantations is threatening the existence of the endangered plant. Scientists have warned that it is likely that one day the plants would no longer be found growing in Sumatra. The Titan, discovered in 1878 by Italian botanist Odoardo Beccari, is the world’s largest cluster of flowers. 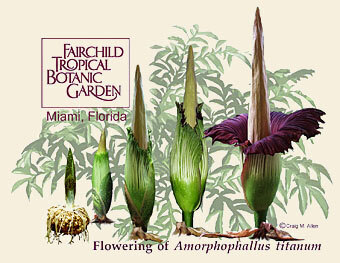 Because of its sheer size, the plant, the Latin name of which means shapeless phallus, was once thought to be a man-eating plant. The plant, the stench of which has been described like rotting meat, is being cultivated by botanical gardens and arboretums throughout the globe. Today, botanic gardens all over the world, including Fairchild Tropical Botanic Garden—which has the largest and most successful pollination and blooming programs, are establishing secure cultivated populations as a reserve against extinction in the wild. The blooming of the crimson colored flower, which lasts only a couple of days, is often treated like a rock concert, visited by droves of people who want to witness firsthand the rare phenomenon.